“Amid the positive footsteps that Palestine is taking towards development, there you find Birzeit University on the top of the mountain as a lighthouse promoting knowledge and prosperity,” said German State of Saxony Minister for Research and the Arts Eva-Maria Stange to Birzeit University president Abdellatif Abuhijleh. 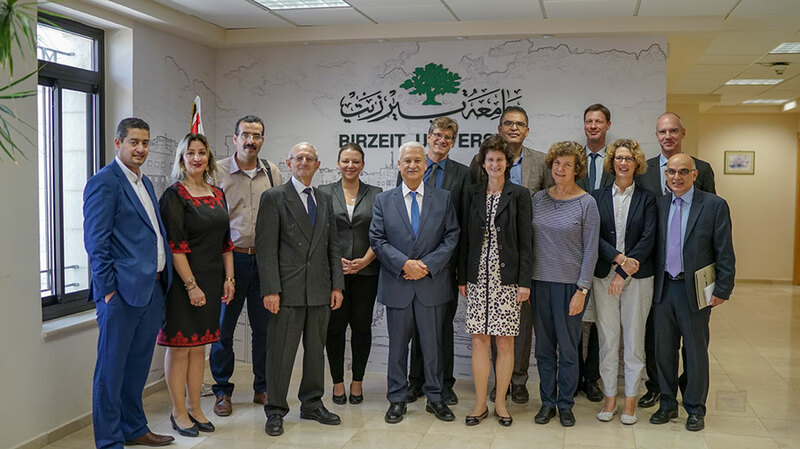 Dr. Stange paid a visit to Birzeit University along with a delegation from the State of Saxony, Germany, to discuss how Germany can expand its cooperation in academia and research with Birzeit University. The delegation was comprised of President of Leipzig University Dr. Beate Schucking, Director of the Museum for Archeology Dr. Sabine Wolfram, Head of Strategic Planning and International Affairs at the State Ministry of Science and the Arts of Saxony Kai Ahlborn, Herder Institute Leipzig representative Dr. Christian Fandrych, and Cultural Attaché at the German Representative Office in Ramallah Ulrich Kienne. The president went on to explain the various research programs the university is working on with German institutions, researchers, and students. The university has strong ties with the Leipzig University, which fruited with the establishment of the bachelor program of German language. The program and Herder Institute at Leipzig are in a DAAD funded partnership allows students exchanges and seeks to continuously develop more programs. 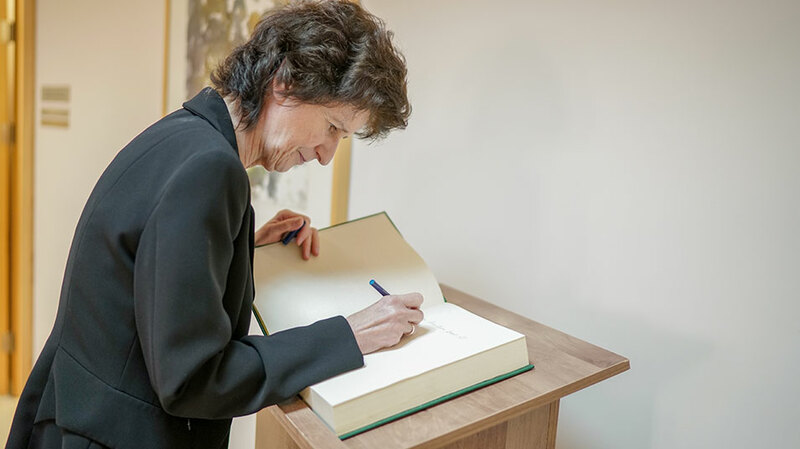 For the past twenty years, the university and the DAAD worked together, where they enjoyed a number of projects, such as in promoting faculty and student exchange, offering scholarships, hosting teaching professors, and launching a bachelor’s program in German Language. The delegation also discussed prospects of cooperation with university professors and staff members, including Vice President of Academic Affairs Dr. Henry Giacaman, Director of External Academic Relations Dr. Amir Khalil, Dean of the Faculty of Engineering and Technology Dr. Wasel Ghanem and Chairperson of the Department of Archeology and History Dr. Amir Barakat. The second part of the afternoon consisted of a meeting with the students of the German Language program, who took her for a tour around campus and to the Palestinian Museum near campus.